Some upscale buyers look for top-tier technologies while others search for elite performance, driver-oriented comfort or a bold road presence. 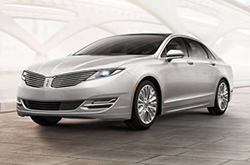 But, the Lincoln MKZ proves that you really can have it all. Blending the worlds of innovation, power and style, the 2016 Lincoln MKZ in Grapevine serves as a versatile choice built for the contemporary driver. 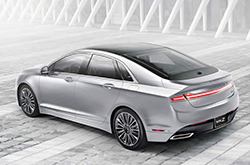 While this year's sedan carries over most of its attributes from the previous model year, Dallas-area buyers will be pleased with the next-generation tech equipment, comfortable amenities and powertrain that elevate the MKZ as a top choice for entry-level luxury sedan buyers. In its 2016 Lincoln MKZ review, Edmunds.com praises the midsize sedan's "eye-catching" exterior that is marked by LED lighting, 18-inch premium wheels, a split-wing grille and chrome accents. Add in the exquisite fully retractable sunroof that is available with a full view of the sky and it's clear that the MKZ is more than just a sedan; it's a representation of a lifestyle of luxury. The sophisticated exterior design is further complemented by the equally elite interior cabin. Standard with 10-way heated power front seats, an auto-dimming rearview mirror, a remote start system and dual-zone automatic climate control, the base MKZ Premiere is a comfortable sedan that turns driving into a hobby. Plus, with technology features like an 8-inch infotainment center, SiriusXM radio, a rearview camera and available 3G Wi-Fi connectivity, the MKZ shows off next-generation innovation. Standard with a continuously controlled damping suspension system, the Lincoln MKZ offers a smooth ride no matter the destination. Plus with the option of a 2.0L Ecoboost I-4 engine, a 3.7L V-6 or an extra efficient I-4 Hybrid powertrain, the MKZ serves as an option for luxury shoppers looking for eco-friendly fuel economy as well as performance enthusiasts seeking plenty of power. Add in the 6-speed automatic with paddle shifters or the hybrid's electronic continuously variable transmission and the MKZ proves to be just as sporty as it is efficient. Plus, our 2016 Lincoln MKZ review is especially impressed with the all-wheel drive model that can turn everyday driving into sporty exploring with ease. 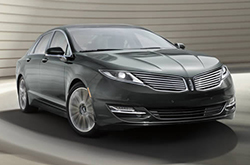 A versatile choice, the 2016 MKZ in Grapevine is available in three series: Premiere, Select and Reserve, as well as four Lincoln Black Label themes. Come visit our dealership in the DFW area today to test drive one of our elite models and experience the luxury for yourself. The 2016 Lexus ES 350, Cadillac CTS and the Infiniti Q60 are eclipsed by the 2016 MKZ in several areas. The MKZ's pronounced exterior styling, unique incar technologies and affordable price are sure to win over TX shoppers. When compared to the vehicles in its class, in terms of price it's clearly a fabulous value, making it a first choice among LINCOLN customers in Grapevine. Take a look at our bullets for more information! We take the time to write detailed reviews of the 2016 MKZ and other LINCOLN models because we want to help make your vehicle search less time consuming. It's our duty to serve reviews authored by the most exceptional automotive writers in the business - it's just one of the things that makes us a top-rated Grapevine area LINCOLN franchise. The above article is jammed with practical material - it contains info about cabin amenities and other specs so that you can make sensible decisions about the LINCOLN you want to buy. After reading Grapevine Lincoln's review of the new MKZ, get in touch with us to schedule a test drive and find out about current lease offers!